Have you tried to gamify your classroom? Do you incorporate game-based learning into your curriculum? Gamification and game-based learning have become buzzwords in education yet some general confusion still exists regarding what each is and what each is not. I would love to clear up any misconceptions. Gamification is the idea of adding game elements to a nongame situation. Corporate reward programs are a good example. They reward users for certain behaviors. Starbucks has done a fine job of getting me to spend more money through their rewards program. It’s not the most sophisticated form of gamification, but I am rewarded for making purchases and can earn extra levels by earning stars based on the program structure. Programs like this have added a scoring game mechanic to commerce. In the classroom, gamification has been integrated in a more authentic manner as some classrooms have become a living, breathing game. Gamification systems like ClassCraft add an adventure game layer on top of the existing course infrastructure. Students create a character, play as part of a team, and earn experience points and rewards based on class-related behaviors. Students are rewarded for helping other students, producing exemplary work, etcetera. Likewise, students can receive consequences for behaviors that are inconsistent with the desired the learning environment. Instead of courses consisting mainly of textbook learning and lectures, classes built using game mechanics such as badges, experience points, levels and leaderboards, boost student engagement by allowing students to choose from “quests” and progress at their own pace through a series of educational activities. My experience has been extremely positive, as evidenced by student engagement in my course. I provide a variety of learning paths for students to choose. All quest lines touch on the same learning outcomes but allow students to follow a path that is student driven and passion based. I do not assign homework in my class, yet students would probably say that they (voluntarily) do more work at home for my class than their other courses, thus expanding their learning beyond the 4 walls and 40 minutes of my class. One final note I would like to make about gamification relates to the bad rap I feel it sometimes gets. I believe gamification has fell victim to the fate of many buzzwords. Like anything, poor implementation receives appropriate critique. Many educators have added a simple gamified element to a class without offering a truly gamified learning experience. In these cases, gamification is nothing more than a glorified point system or the incorporation of badges and awards without authentic meaning attached. I would encourage you to not throw away the baby with the bath water. If you choose to gamify your class, please put proper thought into it, just as you would with any other program you bring to your classroom. 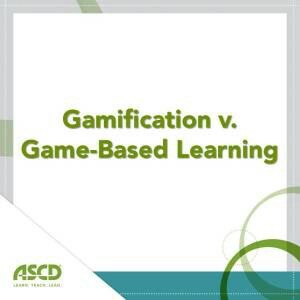 Unlike gamification, game-based learning relates to the use of games to enhance the learning experience. Educators have been using games in the classroom for years. One of my fondest memories of school was the stock market game we played in one of my high school social studies courses. I learned so much about the stock market by investing with my fantasy portfolio. In fact, as a result of this project, I invested my own money (and encouraged my parents and grandmother to do the same) in Colecovision back in the 1980s. The stock soared after our initial investment and my family cashed in. I don’t think learning gets more authentic than that! John Hunter has received a lot of positive attention for his game, the World Peace Game, which he has been playing with his 4th graders. Others have used his game or adapted it to suit the content of their curriculum. This is a wonderful example of a nondigital game created by a teacher to enhance the learning experience of students. In the digital sphere, game-based learning has seen quite a boom in recent years. Commercial games like SimCity, Civilization, World of Warcraft, Mineraft, and Portal 2 have found their way into many a classroom. When tied to the curriculum, commercial games are a powerful learning tool because they are highly engaging and relate to our students in their world. Game-based learning dates back to the 1970s with games like The Oregon Trail that are geared toward education. More recently, education-oriented games like Atlantis Remixed (formerly Project Atlantis) as well as a large collection of games offered in partnership with leading educational game design companies through Brainpop’s GameUp are providing learning opportunities across the curriculum. I am passionate about game-based learning. I teach game design and development to middle school students at William Annin Middle School in Basking Ridge, N.J. My course revolves around the use of games in the classroom with a focus on students creating their own games. You can find out more about my class through my blog. 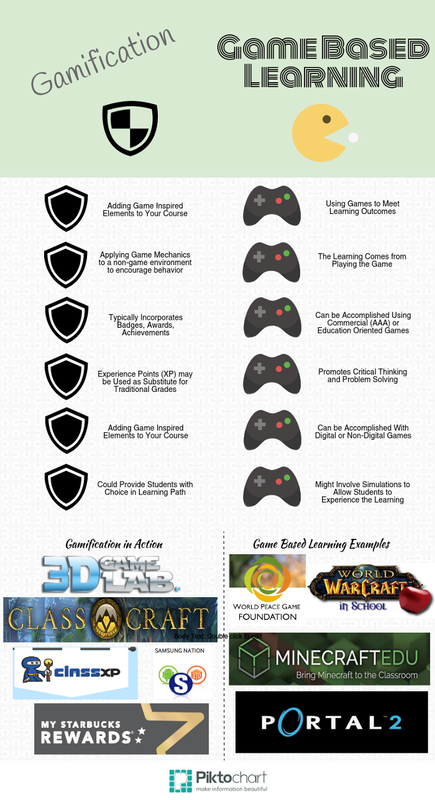 In closing, I would like to provide you with an infographic that will visually portray the differences between gamification and game-based learning.